40024 is rated 5.0 out of 5 by 4. Rated 5 out of 5 by GSS from Beautiful! Great-looking and a great price. Polished brass accessories are not terribly easy to find, so we were extra pleased to find these. Rated 5 out of 5 by BillB from Outstanding Delta Quality This shower bar is solid brass, exceptionally sturdy, and good looking. I'm glad I paid a little more and got the Delta. As far as installation goes it's easy but it MUST be anchored into wall studs. I found my household stud finder couldn't find the stud through the tile surface and had to go purchase one that specifically said it would deep scan through tile. I initially had thought about installing it vertically, centered on the shower wall, but couldn't due to the location of the studs. I installed it at about a 45" angle using adjacent studs and I'm glad I did since it made it easier to reach out and grab. Shipping was prompt and product was well packaged. Rated 5 out of 5 by Tami from Awesome grab bar! Really like the look and feel of this, sturdy, elegant. Great item! What is the best method to remove the cover plates on the delta 24 inch ada grab bar. I have this grab bar as well as the matching one with slide bar for a hand held. I would like some in shorter lengths that match. I ordered 2 Silverton bars from Home Depot but they don't match &amp; the parts that screw into the wall are too big compared with this item. Also, the shorter silverton bar has exposed screws while the little bit longer one has covered screws. I'd REALLY like things to match! Are they available &amp; I just can't find them? Please answer quickly as I am remodeling the bathroom this week.. Thank you for your question. 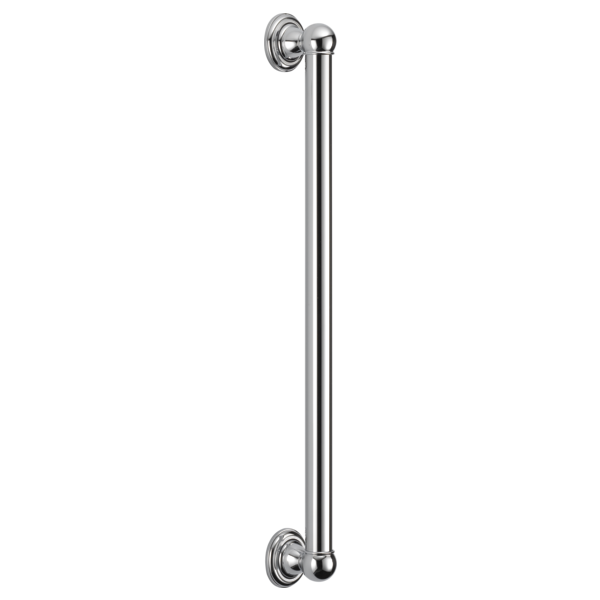 We do offer an 18&quot; grab bar that has concealed mounting. We recommend Delta Faucet model # 41218-ST or 40118-SS. when mounted horizontally, how is it anchored to jousts that are generally 16' on center? How do you install this bar? The cover plate does not seem to be removeable. Does this grab bar come in 18 inch ? what is the model number please? How many inches does the bar extend from the wall once mounted?